Owl Moon inspires lots of great owl activities. There are hundreds of Jane Yolen activities to go along with this prolific author's sundry books. Yolen has written over 300 works, including short stories, novelettes, and a variety of picture books. Her work has been compared to great fabulists like Hans Christian Anderson and Aesop. It's no wonder then that teachers want to use her books in the classroom! The best way to find Jane Yolen activities is to choose one of her books and build a theme or unit of study around that particular book. The Devil's Arithmetic is a historical fiction book about a young girl who doesn't appreciate her Jewish heritage and then finds herself living in a concentration camp. Obviously, the plot is thick with opportunities for teaching about this difficult time. Holocaust Survivors-Have your class do research on the ancestors of those who survived the Holocaust. Numerous places are dedicated to preserving the memory of the Holocaust and retelling the stories of survivors. Holocaust Survivors is an excellent web based research if you're looking to integrate technology into your lesson. Devil's Arithmetic Movie - As it happens Kirsten Dunst starred in this made for TV movie. It is an excellent screen adaptation to the book and worth a movie day after you read the book with your class of course. The movie can be rented or found in a video store with comprehensive stock. Virtual Field Trip - Of course the study of the Devil's Arithmetic dovetails nicely into a study on WWII. To that end, take students on a virtual field trip the WWII Memorial to learn more about those who gave their lives fighting. An excellent book to combine study of poetry with science and nature observation - this book of poems is dedicated to, as the name implies, bird watching. Before having students read the book, take the time to look through the watercolor illustrations, which are truly remarkable. Bird Watching: The obvious activity to go along with this book is to have students go bird watching. Which birds in the book are native to your area? Which birds have your students seen? Have students keep up a classroom chart of birds and their noted behaviors. Nature Similes: Have students observe nature either in their backyards, at the zoo or even online. Then have the students develop their own similes personifying how the animals move, hunt, and generally act. Challenge students to use "million dollar vocabulary". For example, instead of walking slowly, could a bear lumber? Owl Moon is a Caldecott award-winning book about a girl and her father who find a Great Horned Owl on their midnight walk. Fortunately, the study of owls is very interesting, and it would make an excellent all round unit that is sure to ignite students' interest and curiosity in both poetry and ornithology. Owl Pellets - Owls eat their prey whole and then regurgitate that which they cannot digest in the form of owl pellets. What's neat about owl pellets is that you can "dissect" them and find the skeleton of an entire animal making for a fantastic classroom activity with real "wow" factor. 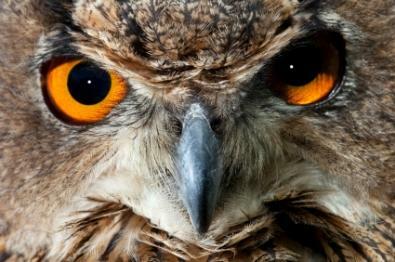 Nature Education Outreach : Owls are one of the more commonly kept birds of prey and if you have access to a local nature center it is likely that someone can come in and speak to your class about owls. While the presentation in and of itself is interesting, challenge students to pinpoint some of the imagery used in Yolen's book to describe owls. Another option for studying Jane Yolen and her book is to do an author study. This can be accomplished in several ways. Beyond the basic biographical information, students can each take a different book or genre of hers and do a report on it. Better yet, have a Jane Yolen fair with each student displaying information on the author and more importantly, her work!